Hello everybody here at Uncommon Designs! My name is Jennifer Carroll and I blog over at Celebrating Everyday Life and as my blog’s name implies, I love to CELEBRATE! I believe you can find reasons to celebrate and make the most of your life every.single.day! But, I’m super-duper busy so I always look for ways to make it beautiful, fun AND easy! 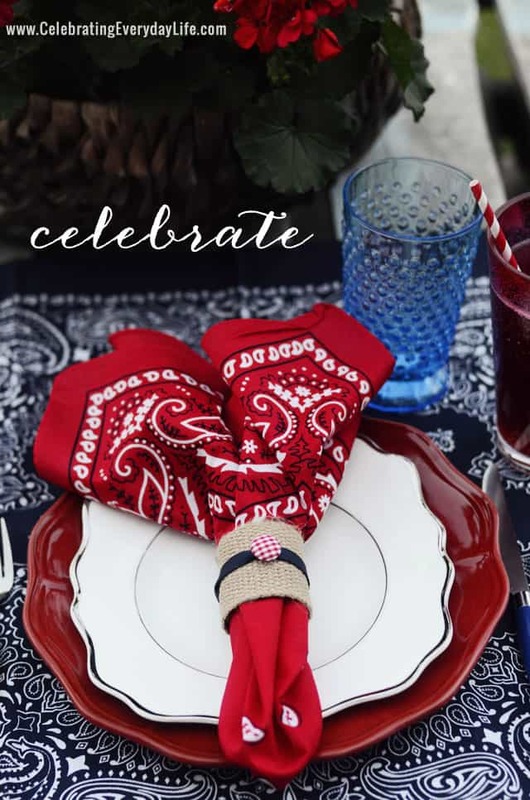 Today, I’m excited to share ideas for a simple summer Fourth of July party placesetting with items you probably already have – bandanas! I love bandanas because they are inexpensive, durable (you can wash them again and again!) and can be used for several themes – from Barbecues to Birthdays to National Holidays – bandanas are up for the job! Here I’ve laid a dark blue bandana on the tabletop as my placemat. Next, I layered a red dinner plate with a white salad plate, both with a cheerful scalloped edge. Festively colored flatware continue my red, white and blue theme, perfect for Fourth of July. 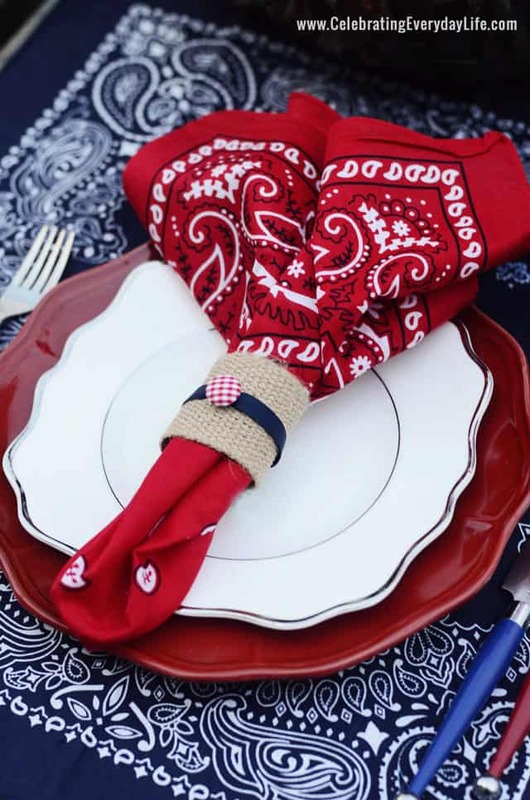 But, the red bandana with the burlap napkin ring, embellished with navy blue ribbon and a red checked button, are the stars of this placesetting in my opinion. This napkin ring is SO simple! 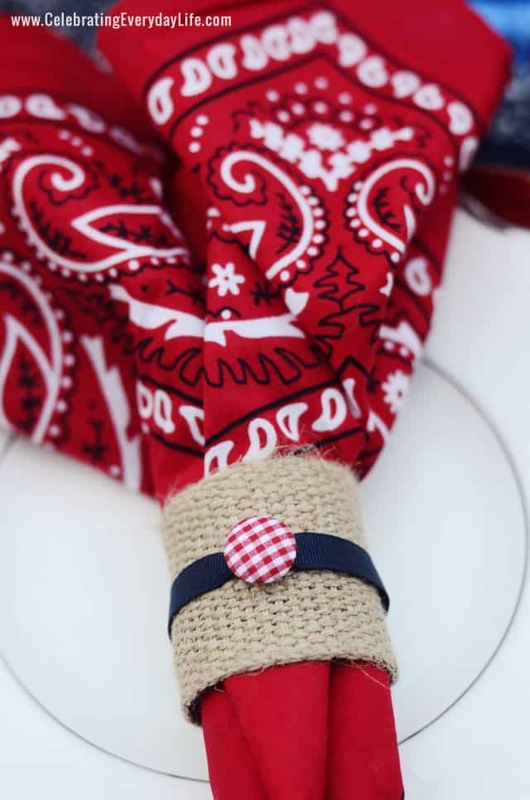 A simple red and white checked fabric covered button threaded through a piece of navy grosgrain ribbon and tied in the back complete this sweet setting. 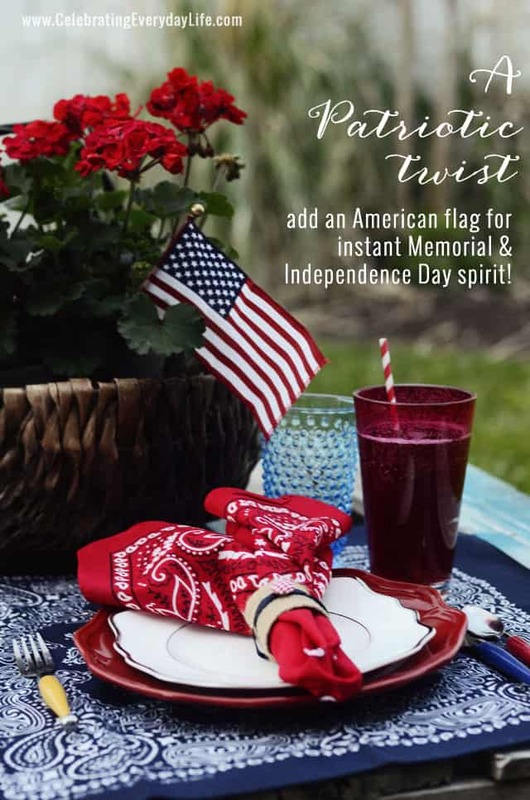 Add a small American flag to the tableau and you have an instant Patriotic setting perfect for the upcoming Memorial Day and Fourth of July parties! Need some centerpiece inspiration? 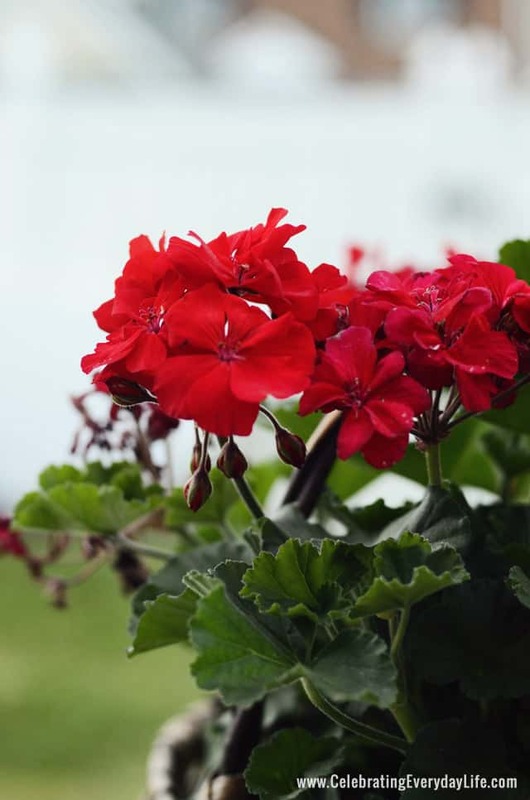 Look no further than your local garden center for vibrant red geraniums! They offer loads of firecracker color, are low maintenance, and are easily incorporated into your porch or garden, adding style and value to your home all season long! I hope you have found a bit of inspiration with this fun and festive Fourth of July tablescape! I look forward to sharing even more tips and ideas for Celebrating Everyday Life with you in June! Thank you so much Bonnie & Trish for inviting me to celebrate with you all today! So simple and adorable American Flag Mason Jar Lanterns. Create a super festive Burlap Flag Banner to welcome your guests! So pretty and I love the scallop plates! 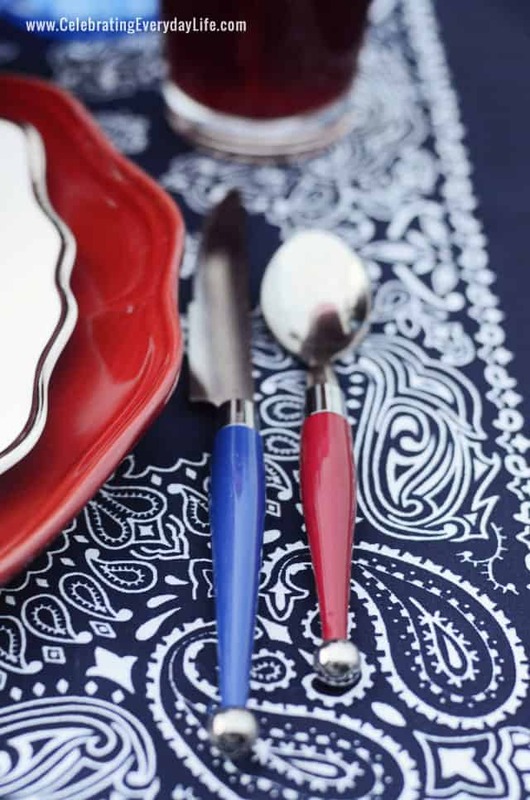 Super cute, I love that you used red and blue flatware! I love this!! Bandanas are a great idea for napkins. Love the whole place setting!! Thanks for the ideas!! Popping in to wave hello girls! What a great day to stop by 🙂 :Hello Jennifer: love the table setting and cute ideas you shared. Red, white and blue scream SUMMER and boy, am I ready!! I love using bandanas to decorate, great job guys! Pinned! I love red, white and blue! This is beautiful! Super cute! I love the burlap napkin rings you used too. Great idea. Love this, what a beautiful place setting!! I love the place setting! the napkin ring and bandana are so perfect! The bandanna adds such touch of fun. That’s Beautiful! Never thought of using bandanas before. So versatile! I’m going to see what I can find in florals and copy this for my own style. So great meeting Trish at BBCChar!